Scholar of the second amoraic generation (3d cent. ), son of Gamaliel III., brother of Judah II., and probably a pupil of his grandfather Judah I. (see. B. B. 83b). Of his early history nothing is known. As illustrating his modesty the following incidents may be quoted: He and his brother were once at Biri, where people remonstrated against their walking on the Sabbath in shoes with golden buckles, which was not customary at that place: they resignedly removed their shoes and handed them over to their accompanying slaves. On another occasion at Kabul they were about to bathe together when the people informed them that they did not consider it moral for brothers to bathe together: Hillel and his brother thereupon desisted. In either case they could have shown the people that their acts were perfectly legal, but they preferred to comply with the local customs (Tosef., M. Ḳ. ii. 15, 16; Pes. 51a). While Hillel is not often quoted in connection with halakot, he was an able interpreter of Scripture; this accounts for Origen seeking his society and consulting him frequently on difficult Biblical passages. It was probably this Hillel that declared, "The Jews have no Messiah to expect, for they have already consumed him in the days of Hezekiah" (Sanh. 99a). He may have been prompted to this declaration by Origen's professed discovery in the Old Testament of Messianic passages referring to the founder of Christianity. 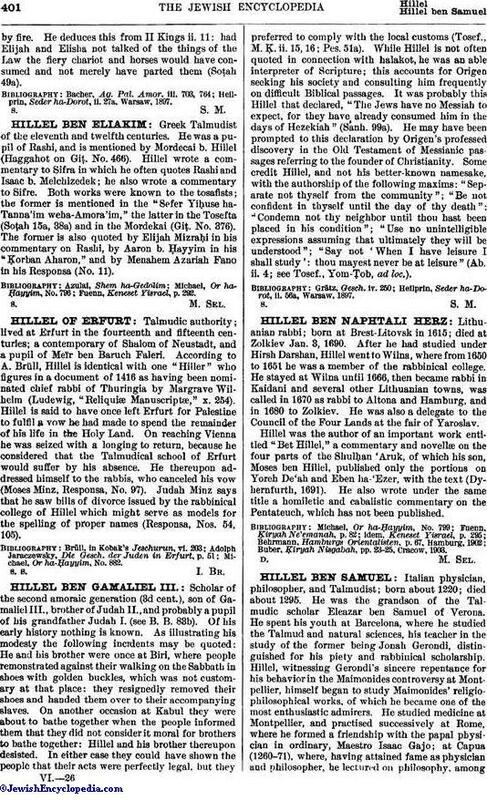 Some credit Hillel, and not his better-known namesake, with the authorship of the following maxims: "Separate not thyself from the community"; "Be not confident in thyself until the day of thy death"; "Condemn not thy neighbor until thou hast been placed in his condition"; "Use no unintelligible expressions assuming that ultimately they will be understood"; "Say not 'When I have leisure I shall study': thou mayest never be at leisure" (Ab. ii. 4; see Tosef., Yom-Ṭob, ad loc.). Heilprin, Seder ha-Dorot, ii. 56a, Warsaw, 1897.